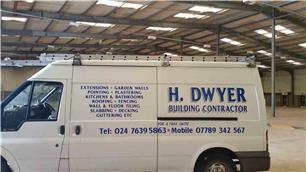 H Dwyer Building Contractor - Builder, Landscaper based in Nuneaton, Warwickshire. Welcome to H Dwyer Building Contractor. We are a family run business with over 20 years experience in the building trade. We are reliable and efficient and all our work is carried out to a very high standard. All types of building work considered. Free, no obligation estimates for all domestic and commercial work.